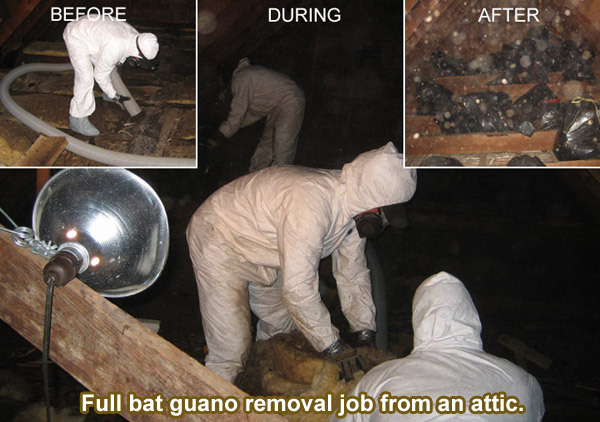 If you have bats in the attic of your home or building, then you have large piles of guano, or waste, as well. 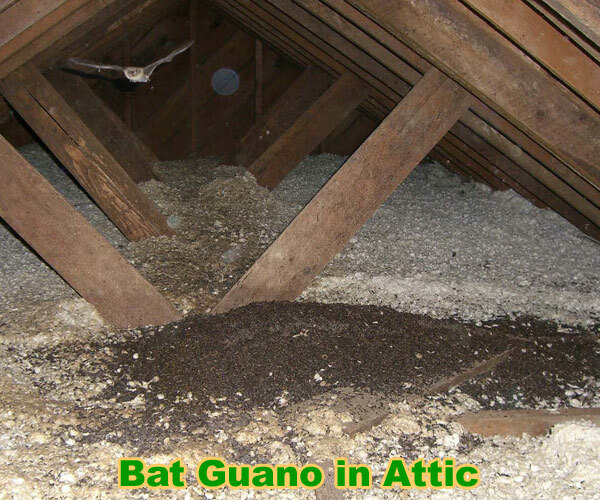 Besides making your house smell bad, guano can cause a lung infection called histoplasmosis that is caused by inhaling the spores of a fungus that is carried in bat guano. Pests, such as cockroaches, are also attracted to guano, causing even more infestation. In addition, the droppings and urine can corrode wood and drywall. In some cases I've seen, there's been so much guano that it corroded the drywall and the weight of it made the ceiling collapse in a shower of guano! Before cleaning up the bat guano in your building, you must first remove the bats and seal off their entry points so they can’t return. It is illegal to fumigate, or harm bats while trying to remove them from a building. It is also illegal to seal off your home at night, while the bats are out hunting, because at any given time there will still be many members insude, and especially so if there are flightless baby bats still in the roost. There are no effective commercial bat repellants; even if light or sound repellants work for a while, the bats will soon get used to the light or sound and return. The only way to remove bats permanently is to perform live bat exclusion. 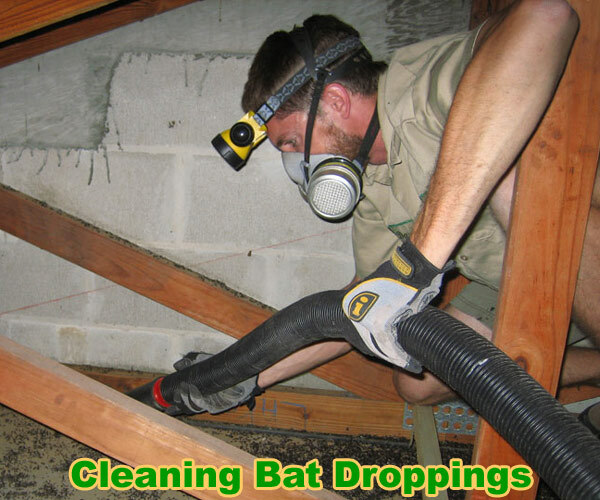 Only after the bats are gone and the building 100% sealed should you bother to begin the bat guano decontamination, removal, and deodorization process. Once the bats are sealed out, then the cleanup of the guano can begin. Because of the health problems associated with bat guano, it is important that you are very careful or have professionals do this, as they are trained in safety precautions in dealing with hazardous waste materials. The first step in clean-up is to remove all of the loose guano from smooth surfaces, such as wood planks or concrete. This can be done using a vacuum that safely contains the hazardous waste products. Next, the bulk of the guano should be removed, by shovel if necessary, and placed in sealed bags. All excess guano should be vacuumed up with a filter vacuum cleaner. Next, all of the smooth surfaces should be scrubbed thoroughly with an enzyme-based cleanser. Walls can also be scrubbed with the enzyme cleaner to remove guano and urine stains. First of all, wear protective gear. I wear a biohazard suit, a disposable Tyvek suit with booties for over the shoes, and hood. I also wear rubber gloves. A good strong headlamp is a great tool for seeing in the attic, and you probably want extra lighting up there. Most importantly, wear a good HEPA air filter mask. A full face mask is best, and definitely not one of those disposable strap-on filters. If the insulation does not appear to have any guano on it, you can spray it with the enzyme cleaner. However, if the insulation is infused with guano, then it will have to be pulled up and replaced, as it won’t be possible to clean all the guano and remove all of the fungus spores that may be in the insulation. This job must also be done while wearing a mask and it’s also a good idea to wet it down so the spores don’t get in the air as easily. In the final step for guano clean up, an atomizing mist machine that produces a fog of enzyme-based hazardous waste cleanser is used. The fogging method will ensure that the cleanser reaches every nook of the area, and it will break down any remaining organic matter left from the bats. It will also eliminate any pheromones left behind from the bats that may attract pests to the area. Once the cleaning is complete, the area will no longer be a health hazard. Go back to my main bats in the attic home page to learn how to remove them, or read the below. One other potential concern with attic cleanup is bat bugs - although they are rare, a displaced colony can mean some are left behind. A good cleanup should get them, though. One of the best ways to perform exclusion is to use a netting or mesh that allows them to leave but not reenter. It’s also good to have the species determined. The reason for this is that different species of bats have babies at different times of the year. Since it is illegal to trap baby bats in a building, the exclusion must be done at a time when there will be no young, flightless baby bats in the roost. The best way to perform live bat exclusion is to wait for the bats to fly out of the building at dusk. Bats generally exit and return as group so if you can get all of the bats out at once, then your job is simplified. There is always a chance that a few bats will remain in the roost, and one-way exclusion devices will help those bats get out. One-way exclusion devices allow the bats to get out, but the bats cannot get back in through the device. A one-way exclusion device can be put on all entry points found. After ensuring that no bats remain, you will want to permanently seal all of the entry points so that the bats cannot return. To ensure that the bats cannot return, it is important that every potential entry point is sealed off. When the bats return to your building, they are going to search for a way in, so you have to be diligent in your prevention efforts. Loose boards, bricks, or pieces of siding should be secured and sealed if necessary. Gaps in eaves are a common bat entry point, so make sure to seal those if any are present. Vents in roofs and siding are also common entry points. You can put fine mesh netting on vents to prevent the bats from entering. Keep in mind that bats can enter a space as small as 3/8 of an inch, so be certain that you effectively seal spaces larger than that. Ridge caps are another common bat entry point, and these can also be covered with fine mesh netting to keep bats out.